Machine Learning and Artificial Intelligence (AI) for the automatic classification of targets. OREM, Utah, April 19, 2019 /PRNewswire-PRWeb/ -- SpotterRF, a manufacturer of industry-leading ground surveillance radar, is announcing it's forthcoming a software release for their NetworkedIO (NIO) 4.0 software platform which adds Machine Learning and Artificial Intelligence (AI) for the automatic classification of targets. SPOTTERai is automatic track classification included as part of the NIO software that ensures a trainable neural network that based on low-level radar data automatically assigns a classification type and confidence level for each target. The use of AI and Machine Learning in the NIO assists in reducing false alerts and allows end-users to improve the performance of the system simply by manually selecting the type of targets being tracked and retraining the AI. "The AI classifier and trainer are an excellent tool to further reduce false alarms and reduce the workload on the operator. After the operator manually classifies 30 tracks or more of at least two different types the AI is able to differentiate between those types, such as between cars and people or birds and drones with confidence that increases as more tracks are classified", said Logan Harris, CEO, and Founder of SpotterRF. The post GIS and Blockchain appeared first on GIS Lounge. 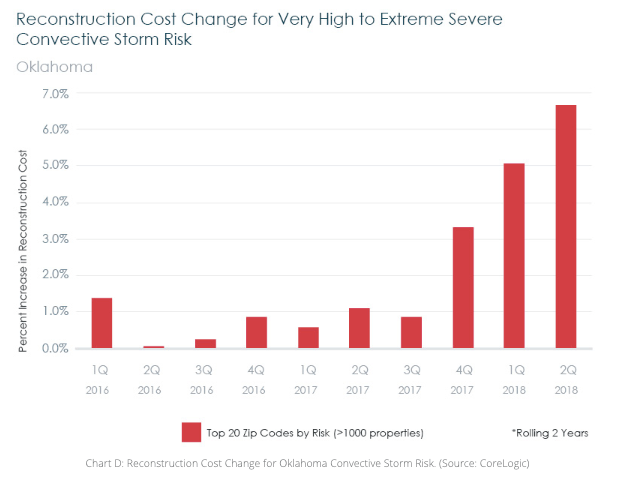 CoreLogic®, a leading global property information, analytics and data-enabled solutions provider, released its newest analysis, the 2019 Insurance Coverage Adequacy Report, which shows increases in reconstruction costs in certain disaster-prone areas range from 5.6 percent to 7.6 percent from 2016 to 2018. According to this report, CoreLogic examines potential underinsurance issues in four regional scenarios of the U.S. with exposure to natural hazards: The Northeast Atlantic and Gulf Coast regions with hurricane-related storm surge risk; California with wildfire risk; and Oklahoma with tornado risk. Munich, 18/04/19 -- European Space Imaging captured an image over Paris on Wednesday 17 April with WorldView-2 at 50 cm spatial resolution. The image highlights the damage caused by the fire at Notre Dame Cathedral that started Monday night. European Space Imaging is also releasing an image captured with WorldView-2 on 11 September 2018 to be used in comparison to demonstrate the level of damage occurred. The image collected yesterday clearly shows the spire and wooden roof completely desecrated leaving behind blackened charred rubble. In addition to the series of before and after images, an animated gif has been provided that you may use within your news story..
Vizzion, supplier of the world's largest traffic camera network, today announced the expansion of its partnership with HERE Technologies, the Open Location Platform company and leading provider of real-time traffic information. The partnership will bring Vizzion's network of over 60,000 live traffic cameras into the hands of traffic editors at the HERE operations center in Chicago. NORTH VANCOUVER, British Columbia, April 17, 2019 /PRNewswire-PRWeb/ -- Vizzion, supplier of the world's largest traffic camera network, today announced the expansion of its partnership with HERE Technologies, the Open Location Platform company and leading provider of real-time traffic information. Vizzion is now supplying the HERE Traffic Operations Center with global traffic camera imagery and video feeds through the Desktop Video Wall application. The partnership will bring Vizzion's network of over 60,000 live traffic cameras into the hands of traffic editors at the HERE operations center in Chicago. HERE uses traffic camera feeds as one of many sources to locate, understand, and report real-time traffic incident information in markets around the world.